Background There is a need to systematically develop research capacity within pharmacy practice. Hamad Medical Corporation (HMC) is the principal non-profit health care provider in Qatar. Traditionally, pharmacists in Qatar have limited training related to research and lack direct experience of research processes. Objectives To determine the interests, experience and confidence of hospital pharmacists employed by HMC, Qatar in relation to research, attitudes towards research, and facilitators and barriers. Setting Hospital pharmacy, Qatar. 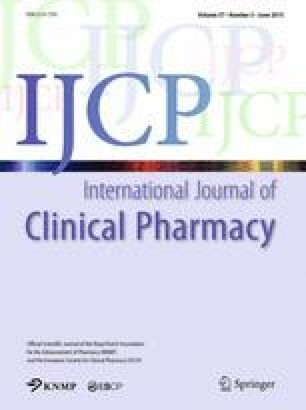 Method A cross-sectional survey of all pharmacists (n = 401). Responses were analysed using descriptive and inferential statistics, and principal component analysis (PCA). Main outcome measures Interests, experience and confidence in research; attitudes towards research; and facilitators and barriers to participation in research. Results The response rate was 53.1 % (n = 213). High levels of interest were expressed for all aspects of research, with respondents less experienced and less confident. Summary scores for items of interest were significantly higher than experience and confidence (p < 0.001). PCA identified four components: general attitudes towards research; confidence, motivation and resources; research culture; and support. While respondents were generally positive in response to all items, they were less sure of resources to conduct research, access to training and statistical support. They were also generally unsure of many aspects relating to research culture. Half (50.7 %, n = 108) had either never thought about being involved in research or taken no action. In multivariate binary logistic regression analysis, the significant factors were possessing postgraduate qualifications [odds ratio (OR) 3.48 (95 % CI 1.73–6.99), p < 0.001] and having more positive general attitudes to research [OR 3.24 (95 % CI 1.62–4.67), p = 0.001]. Almost all (89.7 %, n = 172) expressed interest in being involved in research training. Conclusion HMC pharmacists expressed significantly higher levels of interest in research compared to experience and confidence. While general attitudes towards research were positive, there were some barriers relating to support (e.g. administration) and research culture. Positive attitudes towards research and possessing postgraduate qualifications were significant in relation to readiness to participate in research and research training. Findings are of key relevance when considering the aims of research capacity building of encouraging research, improving skills and identifying skills gaps. The online version of this article (doi: 10.1007/s11096-015-0087-2) contains supplementary material, which is available to authorized users. The authors would like to acknowledge the following for their contribution and support provided throughout this research: Dr. L. McHattie (research design); Dr. M. Bashir, Dr. S. Lutfi, Dr. N. Kheir, Dr. R. Singh, Dr. Wilby, Dr. K. MacLure, Dr. H. Vosper (questionnaire review); E. Watson (E-technology support); all study respondents. Funding was provided by Hamad Medical Corporation. Department for International Development. Capacity building in research. Available from https://www.gov.uk/government/uploads/system/uploads/attachment_data/file/187568/HTN_Capacity_Building_Final_21_06_10.pdf. Accessed 15 July 2014. Hamad Medical Corporation. Available at http://www.hmc.org.qa/. Accessed 15 July 2014. Roberts G. SET for Success: ‘the Report of Sir Gareth Roberts’ Review’, 2002. Available at http://www.rcuk.ac.uk/RCUK-prod/assets/documents/skills/IndependentReviewHodge.pdf. Accessed 15 July 2014.